NYC, 02/21/2019, 6:30PM. 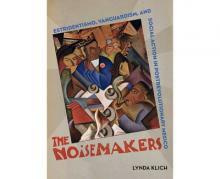 The Noisemakers: Estridentismo, Vanguardism, and Social Action in Post-Revolutionary Mexico. The publication examines Estridentismo, one of Mexico’s first modern art and literary movements. The program includes a discussion between the author Lynda Klich, Luis Carranza (Roger Williams University) and Mary Coffey (Dartmouth College), moderated by Edward J. Sullivan (deputy director and professor, The Institute of Fine Arts, New York University).